Home - The Mitchell Law Firm, L.P. Looking for Bankruptcy Attorney in Dallas? Talk directly to your bankruptcy attorney– not their paralegal. Get a personal touch directly from Greg Mitchell. The Mitchell Law Firm, L.P. handles a wide variety of bankruptcy-related matters, including litigation arising out of bankruptcy matters in state and federal courts. We are conveniently located in North Dallas near LBJ (I-635) and Hillcrest Road. 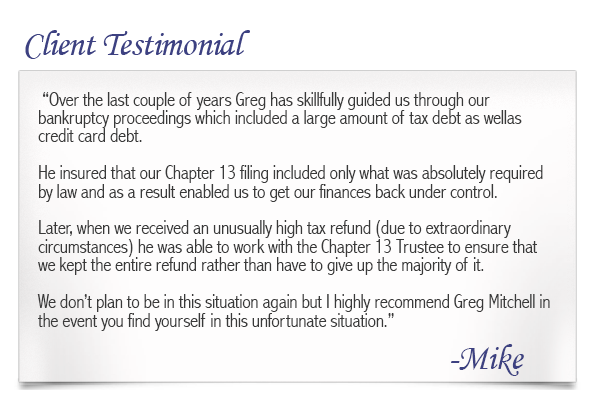 We represent both individual and small business debtors in Chapter 7, Chapter 11, and Chapter 13 bankruptcies. Over time, we have developed a reputation for handling difficult bankruptcy cases, including those involving aggressive secured creditors and nondischargeability issues. We also handle involuntary bankruptcy filings on behalf of both petitioning creditors and alleged debtors. Because of our experience with corporate Chapter 11 cases, we are better able to handle individual cases that are more appropriately prosecuted as cases under Chapter 11. Visit our page to learn more about our Bankruptcy Services. Our attorneys are authorized to practice in all federal district courts in the State of Texas. The content on this website is intended to convey general information about services available by The Mitchell Law Firm, L.P. It should not be relied upon as legal advice. It is not an offer to represent you, nor is it intended to create an attorney-client relationship. Submissions or e-mails submitted to The Mitchell Law Firm, L.P. do not create an attorney-client relationship, and no guarantee of the confidentiality of your information can be provided.